Early D-bars. Note that the bars are wrapped in aluminum foil. D-bars with the new cartons. Note the serrations, dividing the bars in six parts. 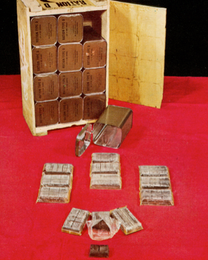 A cellophane wrapped D-bar inserted in its cardboard box. Note that the carton reads Ration, type D as per 1943. D-bar carton with instructions and the ingredients. Note that the B1 Vitamins are listed as 150 I.U. 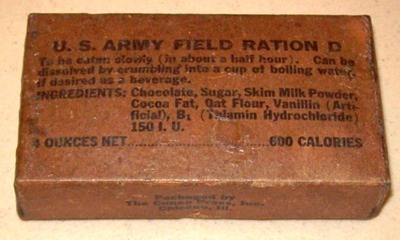 Another D-bar carton. here the B1 viamins are listed as 0.45 mg. Someone didn't read the packaging specification carefully! Twelve D-bars were placed in a cardboard box, and twelve of these boxes were packed in a crate. 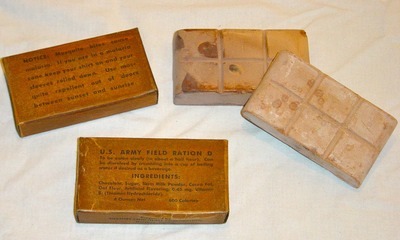 The 2 ounce D-bar as component of other rations. 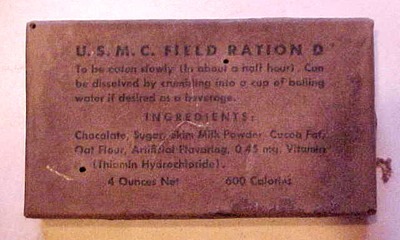 2 ounce bar with the ingredients listed on the wrapper. Erroneously listing 0.45 mg B1 vitamins, this should be half that amount. Three D-bars packed in one carton for the USAAF. This box was used in the B2 parachute pack (see below). The Type B-2 Emergency Jungle Parachute Back Pad. The D-bars fitted in the large rectangular cut-out. The U.S. Marine Corps D-bar. A U.S.M.C. D-bar packaging variation. Late 1944 twelve D-bars were packed in a rectangular can. A D-bar packed in a printed cellophane bag for packing in a rectangular can. 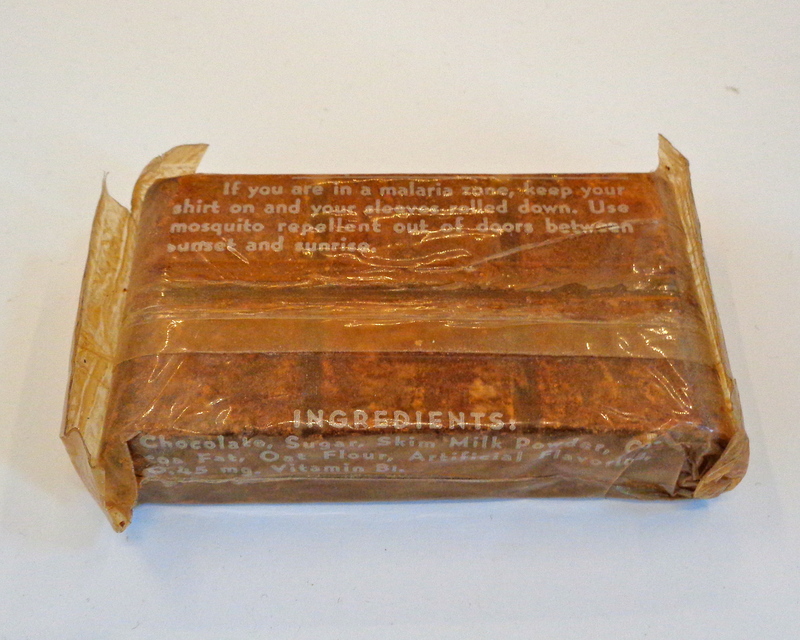 The cellophane bag showing the malaria warning and the ingredients. The back of the D-bar showing the nomenclature and instructions. Reproduction d-bars already showing the "blooming". The upper carton carries the malaria warning. 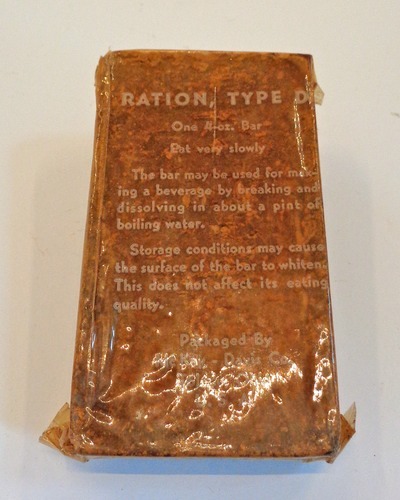 The D ration is one of the well known rations of WW2. Developed as an emergency ration, it was intended to replace a missed meal. 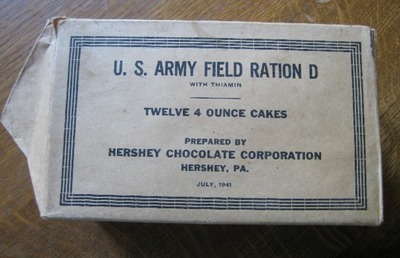 Development begun in the mid 1930's and in 1937 a fortified chocolate bar was standardized as "U.S. Army Field Ration D". 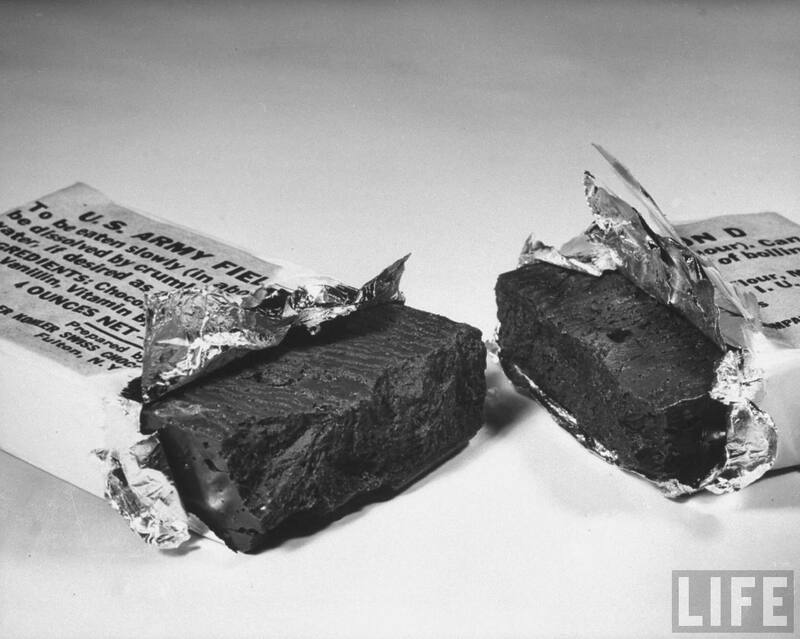 Since it was developed by Captain Paul P. Logan (in collaboration with the Hersey Chocolate Corporation) it was referred to as the Logan Bar before official adoption. It is more commonly referred to as the D-bar. Experimental production. 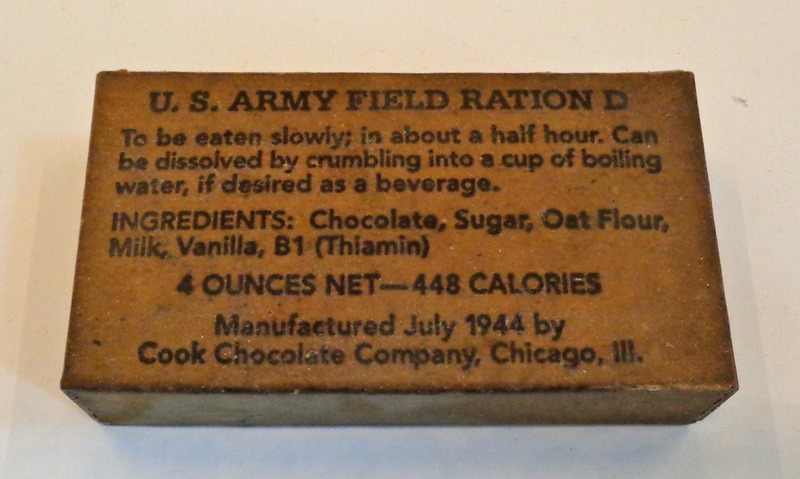 Note the label stating emergency, this was before the official adoption of the ration as "Field Ration D"
Basically this was a 4 ounce chocolate bar with raw oat flour added. The addition of oat flour raised the melting point of the chocolate from 92ºF (33ºC) to 120ºF (49ºC) so it would be usable in the tropics. Because the flour absorbed most of the cocoa fat it made the bar more solid and stabilized the keeping qualities. But it also made the bar hard to bite through. The reason to use oat flour over other cereals is because oat flour is over 90% assimilated in digestion, therefor more nutritious. Two thoughts on palatability occurred. One idea is that the ration should not be tasty. 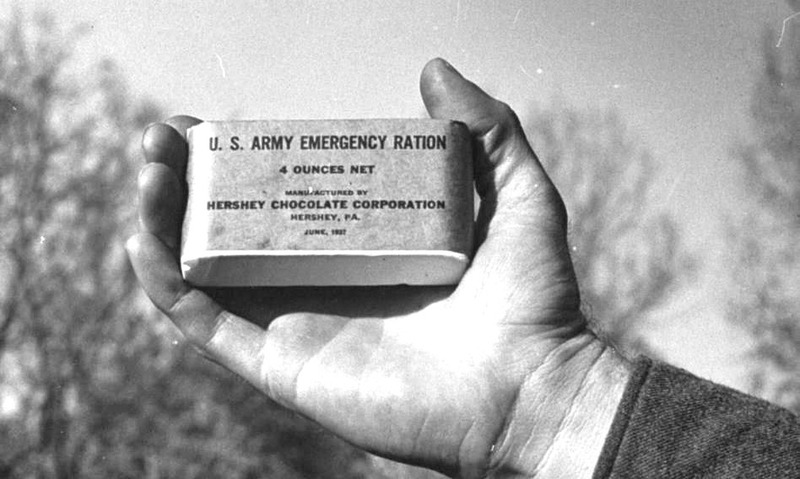 The fear was that soldiers would not save the ration for an emergency situation, but rather consume the ration too early as a candy snack. 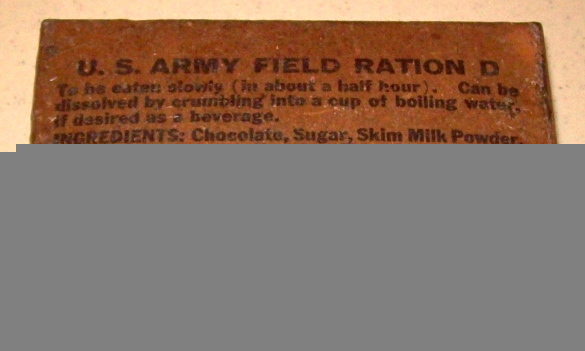 The other thought was that a ration not eaten because it was too unpalatable was worse than no ration at all! finally it was decided that a little flavoring could do no harm. Early calculations place the calorific contents for one 4 ounce bar at 600 calories. 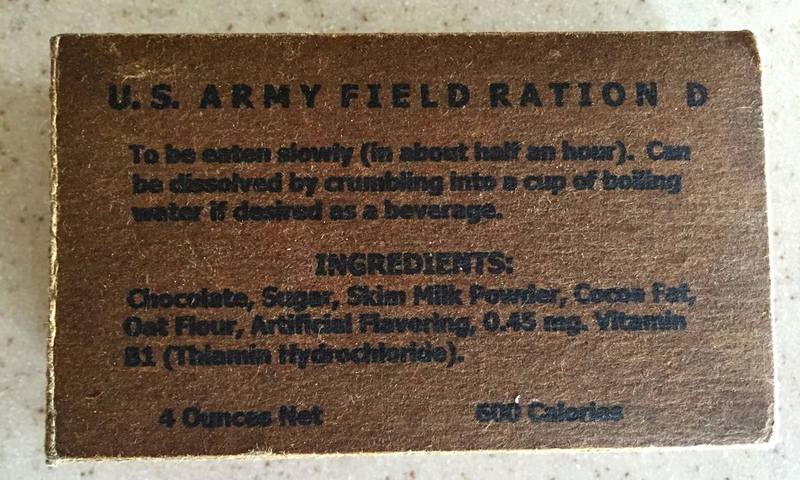 Strangely a D ration in the collection has only 448 calories labeled on the box. The size of the 4 ounce bar is given as 3 13/16" long, 2 1/8" wide and 3/4" high (approx. 97 x 54 x 19 mm). The bar had 1/8" deep grooves in its top surface dividing the bar in 6 equal parts. The sides having a slight slope and the ends being rounded at the top. 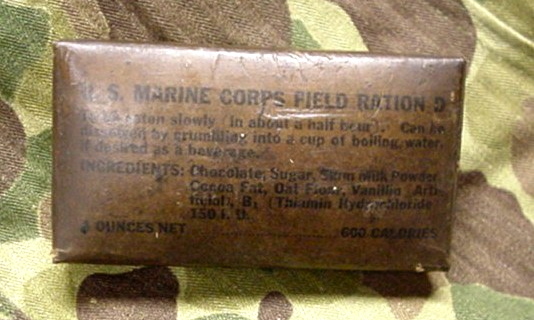 A 2 ounce bar was also developed for use with other rations. It was made with the same formula, but with different dimensions. The early 2 ounce bar was just a 4 ounce bar cut lengthwise in two. But this proved too long to fit conveniently in the K ration box without tearing the cellophane bag. In 1943 the size was standardized as 3 1/8" long, 1 9/32" wide and 13/16" high (approx. 80 x 33 x 20 mm). This bar was divided by two 1/8" grooves across. 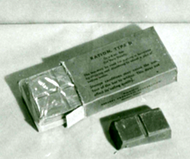 Even a 1 ounce bar was produced in half the hight of the 2 ounce bar for use as a candy component in other rations. This bar has three serrations. 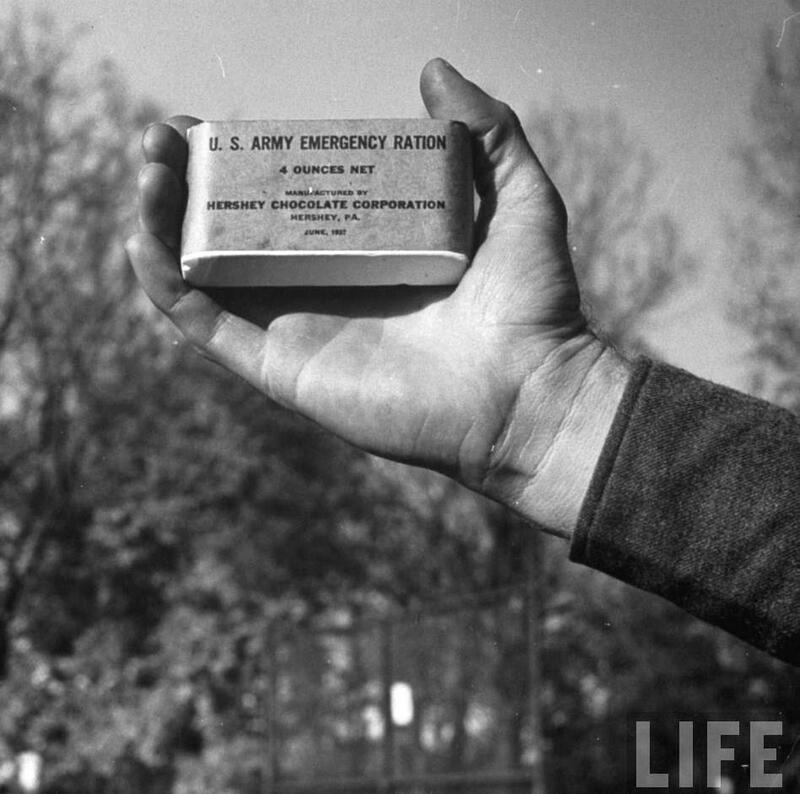 Now that a palatable emergency ration was developed the next problem was how to package it. Early directions instructed an aluminum wrapping with a paper label wrapped around the bar. With the war looming, aluminum foil became a critical material. Another solution needed to be found to pack the D ration. The best solution was to pack a single bar in a cellophane bag that was inserted in a synthetic wax coated cardboard box. 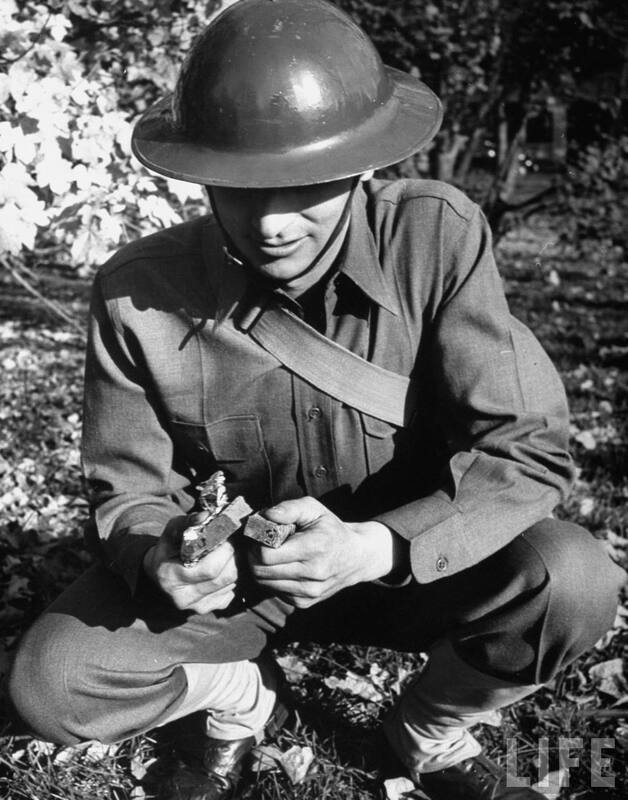 No critical material was used, yet offered adequate protection against moister and (poison) gas contamination, and was light to carry and easy to open. On one panel of this box were printed the instructions and ingredients. The instructions warned that the bar should be eaten slowly because it was found that when eaten too fast it could cause stomach ache, it also suggested that the bar could be crumbled into boiling water to make a hot cocoa drink. Furthermore it stated the company who packaged or manufactured the bar. Complaints from the battle front were received that the bars were sometimes being thrown away because the chocolate had whitened on the surface (blooming). 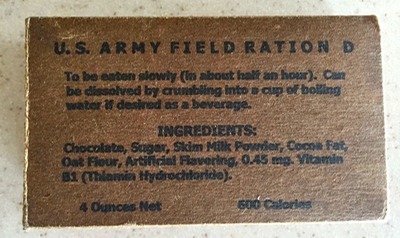 Mid 1943 the label carried the warning that the blooming didn't affect the eating qualities of the bar. The 2 ounce and the 4 ounce bar packaging carried the following addition: "Storage conditions may cause the surface of the bar to whiten. This does not affect its eating quality." "NOTICE: Mosquito bites cause malaria. If you are in a malaria zone, keep your shirt on and your sleeves rolled down. Use mosquito repellent out of doors between sunset and sunrise." 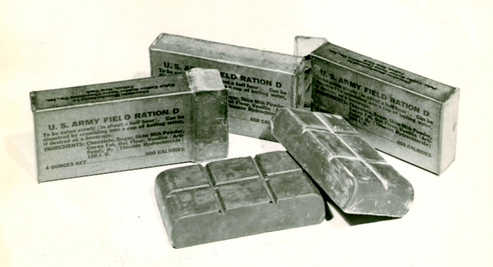 Upon request by the USAAF a box containing 3 ration bars was developed. 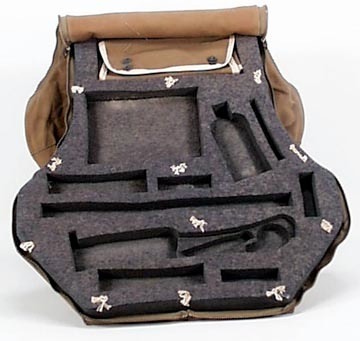 This box was carried in the Type B-2 Emergency Jungle Parachute Back Pad. Three cellophane packed D-bars were placed next to each other with the middle one placed upside down so that the beveled sides fit parallel against each other. This box was also coated with a synthetic wax. 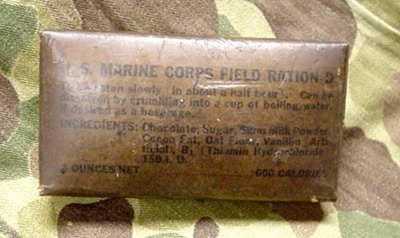 The Marine Corps also showed interest in this new emergency ration and early in the war these bars for the Corps were packed in cartons labeled: U.S. Marine Corps (or U.S.M.C.) 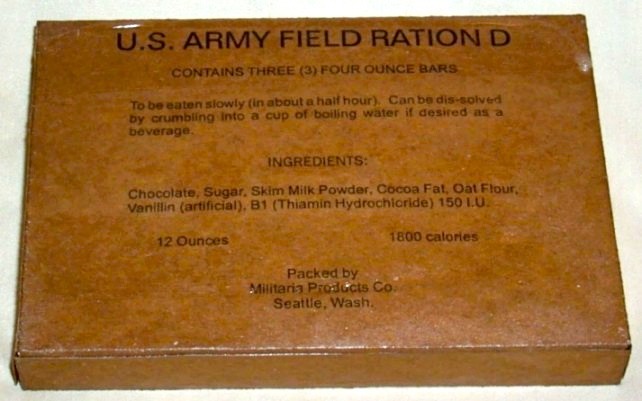 Field Ration D instead of the usual U.S. Army Field Ration D.
Twelve cartons containing a single bar were placed in a cardboard box, and twelve of these boxes were placed in a wooden crate for shipment. Or eight cartons with three bars were placed in a box totaling 24 bars, six of these boxes were placed in a wooden crate for shipment. Both crates containing a total of 144 bars. The individual cartons were sometimes referred to as inner cartons and the cardboard box was referred to as the outer carton, or master carton. 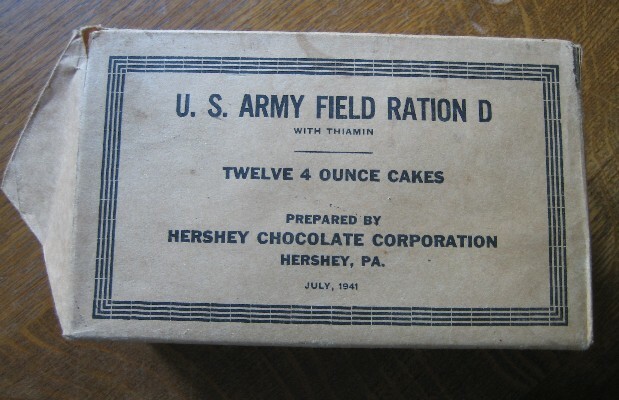 (A little confusing since the K rations also came in an inner and outer box.) The outer box was of heavy quality cardboard, or of lesser quality wax coated cardboard.